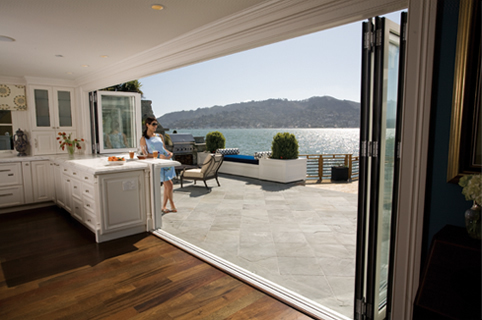 The installation of exterior French doors provides the homeowner with the feeling of bringing the outdoors into the home. If however you install a glass wall that opens to the outside, you not only have the feeling that you have brought the inside of your home outdoors, you actually have. On a family room wall, as shown in Figures 1 and 2, it can make the backyard part of the family room. On a bedroom wall, as shown in Figure 5, you can sleep as if you are outdoors absorbing the fresh air as well as the clear blue sky. 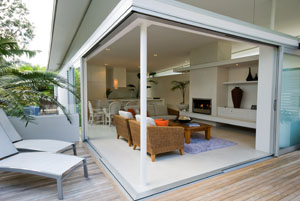 Glass walls that open are designed to protect you from the elements. Even homes that are in northern climates can have the benefits afforded by a glass wall that opens to the outdoors, at least during some of the year. Glass walls that open can be installed in new construction or in renovations and remodels. However, if you are planning a glass wall in a renovation or remodel it is wise to discuss your design with a structural engineer to ensure that the area above the glass wall is properly supported. Opening glass walls do not provide any support for building elements that are positioned above the glass wall. Opening glass walls are an innovation that used to be confined to commercial properties, however now you can take advantage of the architectural enhancement that they can provide to any home. Rather than thinking about your home as interior space and exterior space, start thinking about your home as a combination of both. Whether you want to bring the indoors outside or the outdoors inside, glass walls that open will make that dream a reality.